Forest Lawn Cemetery was established in 1906 as the last of eight municipal cemeteries in Norfolk. The City purchased a tract of Norfolk County property from George S. Bunting to create the cemetery. The Langley Family Burial Ground, the family that owned the land for generations prior to Mr. Bunting, was included in this purchase and remains a historical point of interest today with interments dating back to the 1700s. Forest Lawn boasts several fraternal and memorial lots including the Seaman's Friend Society Lot and the U.S. Army's 111th Field Artillery Batallion and 29th Infantry Division Memorial. The Seaman's Friend Society Lot is the final resting place for hundreds of foreign sailors who passed away at sea or upon arrival to our shores. The Seaman's Friend Society purchased the lot and paid for interment expenses to ensure that these brave men forever rested in a place of honor though they were very far from home. 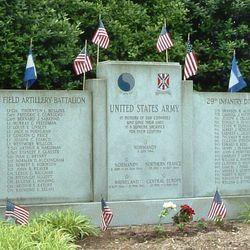 The U.S. Army's 111th Field Artillery Battalion and 29th Infantry Division Memorial was erected in honor of soldiers who gave their lives during World War II in such theaters as Normandy, Northern France, the Rhineland, and Central Europe from 1944-1945. It is the site of Veterans Day and Memorial Day Services at Forest Lawn. Comprised of more than 165 acres of land, Forest Lawn Cemetery is a natural arboretum with over 70 species of trees including crape myrtles, black walnut trees, dogwoods, and magnolias. Search for an interment in Forest Lawn. Access a listing of Forest Lawn interments. Learn about Norfolk Notables at Forest Lawn. Learn about Norfolk's municipal cemeteries' oldest interments, the Langley Family Burial Ground at Forest Lawn Cemetery. exploration of our beautiful Art Deco community mausoleum. Click on one of the links below and get ready to learn! Forest Lawn Tour of Trees Every Spring & Fall! As the most modern of Norfolk's eight historic municipal cemeteries, Forest Lawn is not yet in a state of deterioration comparable to Elmwood, Cedar Grove, and West Point Cemeteries. However, its unique artistic and architectural assets need to be protected. The Forest Lawn Community Mausoleum serves as an excellent example of the cemetery's architectural assets. Erected in 1919, its Art Deco era design was lovingly created by Sidney Lovell (1867-1938) - a native of Racine, WI who apprenticed with Colonel James Wood, a recognized Chicago architect praised for his theatre designs. After designing and remodeling opera houses and East India style theatres for 18 years, Mr. Lovell began building mausoleums in 1912. The Forest Lawn Community Mausoleum is a fine example of Lovell's work. Its exterior facade and interior furnishings are constructed of high quality Alabama marble. The interior features ornately carved marble benches and a Frank Lloyd Wright skylight created by the Temple Art Glass Company in Chicago, IL. The mausoleum entryway and interior family room gates are of bronze by the J.S. Heath Company also of Chicago, IL. The mausoleum is one level with a spacious chapel in the central portion. Four corridors surround the chapel; these lead to five family rooms, 24 companion crypts, 104 single crypts, and 150 columbaria. The Forest Lawn Community Mausoleum's architectural beauty stands testament to a time when no luxury was spared to honor the deceased. As that time has passed, we hope to preserve this historic structure for future generations to learn from and enjoy.